From free chips and guacamole to buy-one-get-one free burritos, Chipotle has served up several promotions for free food this year as part of its ongoing campaign to win customers back. In their continuing efforts, Chipotle unveils Chiptopia Summer Rewards, a loyalty card offering customers free food and Bonus Rewards just for eating at Chipotle. From July through September, customers participating in Chiptopia can earn free rewards simply by eating the food they already love. Chiptopia is not a typical rewards program. Rewards are not based on the total amount a customer spends, or on accumulating points. Instead, Chiptopia rewards customers for making multiple paid visits to Chipotle within a given month. 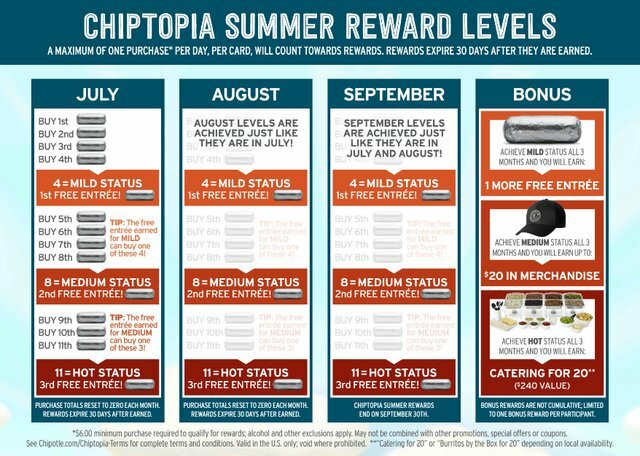 Chiptopia Summer Rewards offers three different status levels: Mild, Medium and Hot. Just four visits, with a qualifying purchase during each, earns Mild status and a free entrée. Someone who achieves the Hot level in all three months can earn up to nine free entrées over the course of the rewards program, plus a $240 “Catering for 20” Bonus Reward. Customers who achieve the same status level for three consecutive months in a row will be eligible for Bonus Rewards. Achieving Medium status all three months earns $20 in Chipotle merchandise at store.chipotle.com. Achieving Hot status all three months earns catering for 20 (a $240 value). Customers who register for the program in July earn a free chips and guacamole with their first entrée purchase (of $6 or more, before tax) and will be eligible for special Bonus Rewards, available for redemption at the end of the promotion. Users are able to register at any point from July through September; however, the free chips and guacamole and Bonus Rewards are only available to those who join the program by July 31. Bonus Rewards are only available to those customers who achieve status levels all three months. Rewards earned during Chiptopia expire 30 days after they are earned. Mild and Medium Bonus Rewards expire on Dec. 31, 2016 and the Hot Bonus Reward expires on March 31, 2017. The rewards program is valid in the U.S. only and cannot be combined with other coupons, promotions or special offers. For complete details about Chiptopia Summer Rewards, please visit Chipotle.com/chiptopia.